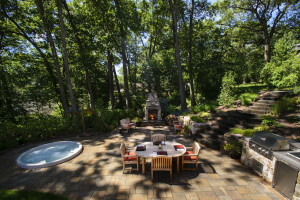 Outdoor Escapes - Fox Hollow Landscaping and Design, Inc. Whether you are looking for lush plantings around a private pool, or you enjoy entertaining and the functionality of a patio or outdoor kitchen and full wet bar, our design team is skilled in taking outdated and non-functional landscapes and turning them into your wildest dreams through detailed landscape plans and 3-D imagery. Fox Hollow can also create secluded meditation areas with water features and ponds or for you golfers a personal putting green and chipping area bringing the golf course home to you. These are only a few of the many luxury items that are offered along with the “usual suspects” of patios, walkways, and landscape plantings. From the design phase to implementation and installation, to the care and maintenance afterwards Fox Hollow can be your one stop shop. The only thing we ask from you is to enjoy the created space.